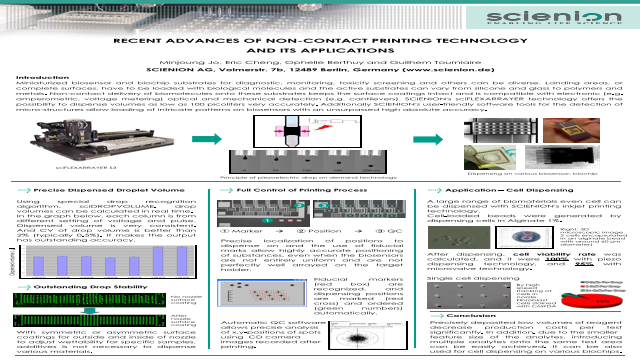 Abstract: Miniaturized biosensor and biochip substrates for diagnostic, monitoring, toxicity screening and others can be diverse. Landing areas, or complete surfaces, have to be loaded with biological molecules and the active substrates can vary from silicone and glass to polymers and metals. Non-contact delivery of biomolecules onto these substrates keeps the surface coatings intact and is compatible with diverse detection fields. sciFLEXARRAYER technology offers the possibility to dispense volumes as low as 100 picoliters very accurately. Additionally user-friendly software tools for the detection of micro-structures allow loading of intricate patterns on biosensors with an unsurpassed high absolute accuracy.